Photo by Joe Rivano Barros. A protest at City Hall on Friday night saw dozens of protesters and several journalists shoved and manhandled by sheriff’s deputies who arrested 33 people, including one juvenile. Swarms of deputies wearing riot helmets and armed with batons pushed back protesters who had squared off against them inside city hall. Several scuffles broke out between protesters and deputies, who used their batons to corral the resistant crowds, oftentimes pushing individual protesters against columns and the two security desks that flank the City Hall entrance. Crowds pushed back against the lines of deputies attempting to advance them towards the city hall exit. Some protesters were roughly arrested by deputies. One man was dragged across the floor by his arms by deputies before being zip tied and taken away. At least three reporters were pushed on the floor and against desks by deputies despite identifying themselves as members of the press. The more than 100 protesters were splintered into two groups by deputies: one larger group near theCity Hall entrance that flowed outside of the building and another group of some 17 protesters further inside the building. The smaller group was surrounded by deputies near a desk, and protesters there locked arms with one another to form a circle. Protesters from the smaller group were eventually separated out one by one by deputies, sometimes violently, and all were eventually arrested. Some resisted arrest and shoved back against deputies but were subdued. The larger group of some 50 protesters inside City Hall and dozens more outside squared off against a line of deputies amassed near the entrance doors, while the smaller group continued chanting from further within. The larger group held their place for more than 90 minutes as deputies arrested everyone in the smaller group. Deputies then turned their attention to the larger group near the doors, pushing them against the entrance and moving them outside. At least one protester was arrested as protesters pushed back against the line of deputies. They were eventually all pushed outside, where they descended the City Hall steps and squared off against deputies again without incident. The charges for the protesters were unlawful assembly, trespassing, and resisting arrest, according to Captain Paul Miyamoto of the sheriff’s department, and may include other charges. Those arrested were taken to the county jail at 850 Bryant St. 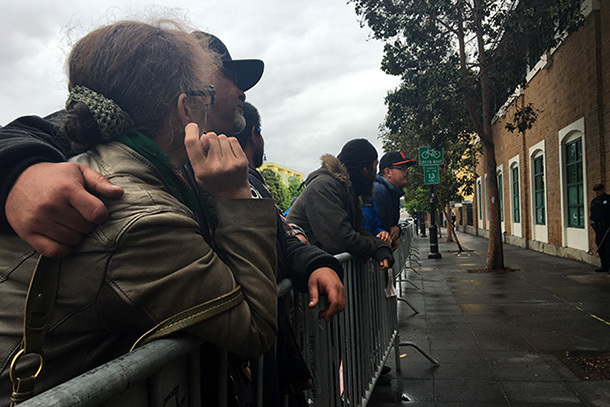 The protest followed two actions by groups of supporters of the five hunger strikers known as the Frisco Five, who have been camped outside of the Mission District police station for 16 days but were taken to the hospital for monitoring on Friday morning. The hunger strikers have been calling for the firing of Police Chief Greg Suhr by Mayor Ed Lee since April 21, and protesters came to City Hall on Friday afternoon to reiterate those demands by banging on the mayor’s door. The City Hall protest began when some 40 supporters of the hunger strikers assembled outside the mayor’s office near 4 p.m. and began hammering on the door, calling for the firing of the police chief. They promised to remain in City Hall until the chief was fired. Protesters used drumsticks and their fists to pound on the mayor’s door for some 30 minutes, though it was unclear if the mayor was inside. Sheriff’s deputies eventually moved between the protesters and the office door, prompting the group to move to the rotunda’s interior steps. There, they continued chanting for another hour, referencing the hunger strikers and their hospitalization earlier in the day. All five strikers were taken by their doctors to the hospital for monitoring and said they will continue their strike from there. “Enough is enough, we need Mayor Ed Lee to fire Chief Suhr, because we are on day 16, day 16 of a hunger strike,” she said. The group then moved back outside the mayor’s office, where they stayed for several hours, chanting and blaring music. Captain Edwin James with the sheriff’s department told protesters they would face arrest if they did not leave the building after closing time. The group would be given several warnings, James said, but could be arrested if they stayed past 8 p.m.
Drea Nieto, one of the organizers of the protest and a supporter of the hunger strikers, said several in the group were prepared for arrest but that there was no plan for arrest per se. Around 4:15 p.m., some seven supporters of the hunger strikers who remained at Mission Station after the strikers were hospitalized had packed up the strikers’ tents and some of their belongings, but were surprised when they were visited by Public Works cleanup crews. As Public Works staff began to deposit refuse and belongings in trucks, officers from Mission Station moved the remaining hunger strike supporters off the sidewalk, then moved barricades that have been set up along the station’s walls for roughly a week forward across the sidewalk, barring the protesters from re-occupying the sidewalk. A supporter on the scene said the workers explained the department’s “bag-and-tag” procedures, which allow individuals to retrieve belongings collected by Public Works from a storage facility. The protesters elicited a promise from Public Works staff to keep a memorial to police shooting victims with flowers and a few photos intact, which was kept. “They said they would leave the vigil…They said they would leave that after much protest,” said hunger strike supporter James Burch. As word of the sweep spread among hunger strike supporters, more of them arrived at the station, beginning to chant and to shout at officers. 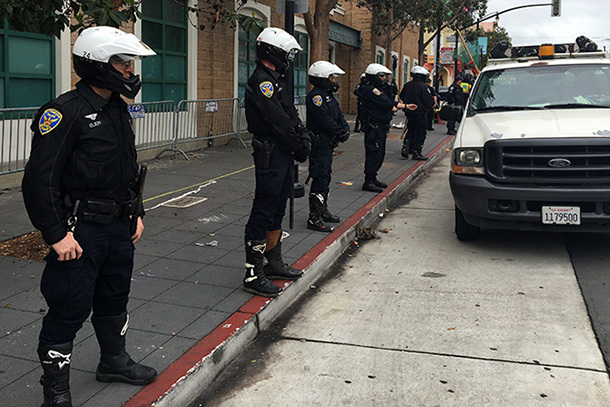 At one point, traffic was blocked in both directions on Valencia Street between 17th and 18th streets, and one tech shuttle was halted and had to back out of the block to be rerouted. Some time after protesters cleared out of one traffic lane, a few returned to block it anew. A brief argument developed between officers on motorcycles trying to convince them to clear out, but no physical altercation developed and no arrests were made. Once Public Works staff completed their sweep and pressure-washed the sidewalk, the barricades remained in place and several officers were posted at the station’s entrance. When supporters from Mission Station arrived at City Hall just after 6:30 p.m., they found the doors shut and were barred from entering – sheriff’s deputies said the building manager had locked the doors. But the protesters already inside promptly marched down City Hall ‘s main interior stairwell and announced they would depart and return to Mission Station. By opening the doors to leave, they allowed the wave of protesters who had previously been locked out to enter. A scuffle between a protester and sheriff’s deputy ensued, prompting angry shouting and more chants. Eventually, a row of deputies blocked the protesters from advancing inside the building. The group then squared off against the police and deputies and continued chanting. Well past 8 p.m., which marked the official closure of City Hall for the night, protesters were still in place, risking arrest. They faced a line of sheriff’s deputies and refused to leave when several dispersal orders were read to them through a megaphone. The standoff between law enforcement and protesters turned violent when deputies moved against the crowd and pressed them with their batons, leading to the confrontations and arrests. After being forced from the building near 11 p.m., dozens of protesters remained gathered just outside City Hall , giving speeches and waiting for information from those arrested. That metal detector had been layingsideways, half in and half out of he main door and as police were shoving people out, they were all tripping over it and piling up. Thanks for the reporting, Joe and Laura. Where do the police get off pushing people off a public sidewalk? They have a right to protest there. Please report such incidents as the First Amendment violations (i.e. crimes) that they are. They have a right to be on the street, not the steps. You have to have a permit to protest on the steps as that is not public. If you watch, the police are moving them off the steps onto the street. Also, it does not matter if they are being disruptive or destroying property etc, they can remove them from the streets….just a side note. Um, the right to protest and freedom of speech are not absolute. Theres certain places you cant say certain things, certain things you cant say at all, and certain times you arent allowed to protest. I mean, you obviously can do all these things..but the point is if you choose to do them, police can (and are supposed to) arrest you. Please consider revising your opening sentence. To lead with “a violent protest” implies to most people that the protesters were violent, whereas everything you describe in this article sounds like a peaceful protest broken up violently by the police–the same police whose habitual excessive violence the protesters are trying to spotlight. Agreed – removed the word “violent” from the lede. Is this all over text messages? I can’t seem to find any details on what touched this off. This kind of protest is what happens when people don’t have anything to make them feel like they’re doing something important.